Temperatures are important to enthusiasts and gamers, so we took a bit of time and did some temperature testing on the EVGA GeForce GTX 760 video card. 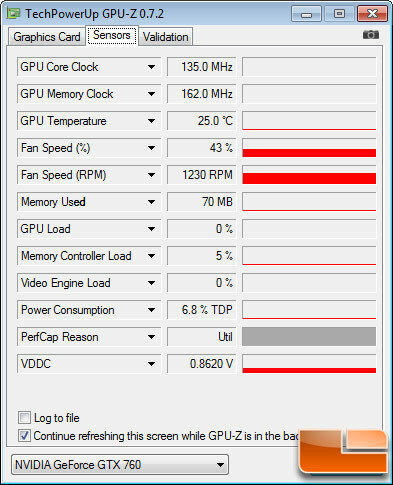 The EVGA GeForce GTX 760 2GB Superclocked w/ ACX cooling video card had an idle temperature of 25.0C in a room that was 22.0C (72F). Keep in mind that the EVGA GeForce GTX 760 uses the NVIDIA GK104 “Kepler” GPU that has over 3.547 billion transistors! When playing Far Cry 3 and Battlefield 3 for about 30 minutes each, we hit 67C and did not get any hotter than this. 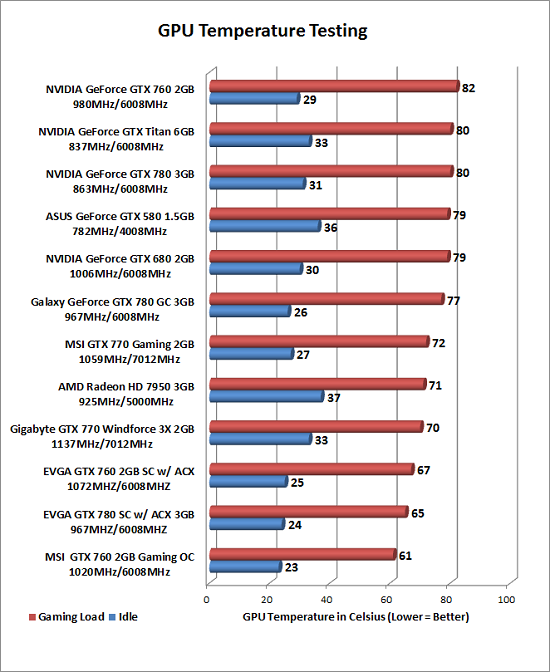 The EVGA ACX cooler does an impressive job keeping the GeForce GTX 760 2GB Superclocked card running cool. Notice the fan speed went from 1230RPM at idle to 1740RPM when gaming. You really can’t hear the card with it in your system at idle, but when you start gaming you can hear the fan a bit. 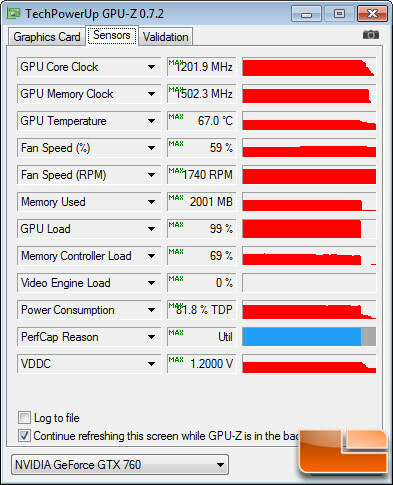 Notice that the GeForce GTX 760 2GB Superclocked card is hitting 1202 MHz on the core clock when gaming thanks to NVIDIA GPU Boost 2.0 and these nice low GPU temperatures! This low idle temperature makes the EVGA GeForce GTX 760 2GB Superclocked w/ ACX Cooling one of the coolest running video cards that we have looked at recently.